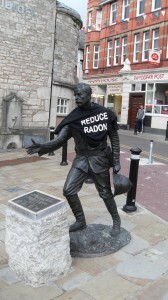 On a recent trip to Denbigh, North Wales Radon Tee was delighted to be worn by none other than Sir Henry Morton Stanley, explorer extrodinaire famed for tracking down David Livingstone in Africa and uttering the phrase “Dr Livingstone, I presume”. The reporter for the New York Herald, who was born in Denbigh, was sent to Africa in the 1870s in search of missionary and explorer, Dr Livingstone, who was attempting to locate the source of the Nile. Radon Tee is on an adventure of its own, spreading the word that radon could be accumulating in homes and workplaces across the country without the occupants being aware. PropertECO were in Denbigh to carry out radon remediaton work to a property that had been found to contain radon levels in excess of 2000 Bq/m3 – more than ten times the maximum level recommended by the Health Protection Agency (HPA). Works involving air management have now been completed at the property and test kits will now be placed to confirm that the works have been effective and that the concentration of radon has fallen. Radon test kits are available from PropertECO – explore our site to find out more, and why all properties should be tested.